Multiple reports say Zegura criticized an official from the sidelines in the Browns' Week 2 game. He's now not on their radio broadcast for Week 3. In shocking news, the NFL apparently doesn’t want sideline reporters arguing with its officials. Vince Grzegorek of Cleveland Scene first reported Wednesday that the Cleveland Browns’ radio broadcast has removed sideline reporter Nathan Zegura from Thursday’s broadcast after Zegura apparently went after an official about a call during the team’s 21-18 loss to the Saints Sunday. 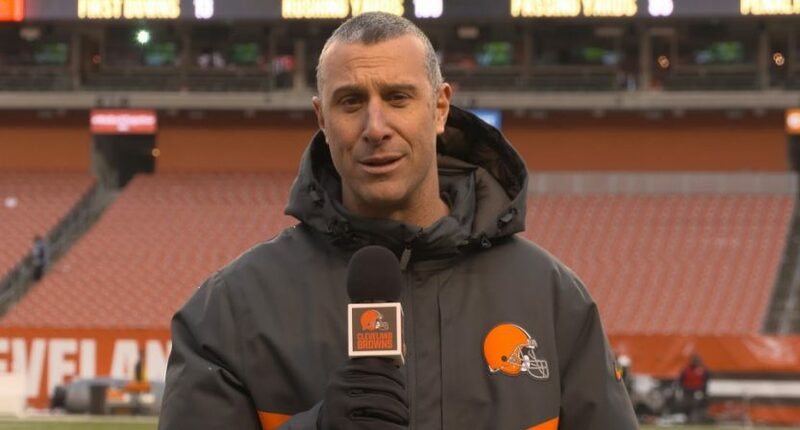 Browns sideline reporter Nathan Zegura has been banned from the team’s radio broadcasts for eight games, beginning with Thursday night’s game against the Jets, for sideline conduct during Sunday’s 21-18 loss to the Saints, a Browns spokesman told cleveland.com. …If all goes as planned, Zegura will be back on the job Nov. 25, the game after the bye week. …During the ban, Zegura will also not participate in the pre-game or post-game shows. Zegura, co-host of Cleveland Browns Daily which airs from 1-3 Monday through Friday on ESPN 850, will also be removed from that show for two weeks. A source said this is not the first time the Browns have had to reprimand Zegura, who was told by officials to move his location on the sidelines Sunday at the Superdome after yelling at one of them. Yes, beyond his work for the Browns (which includes videos for the team website and social channels, like the screencapped one above) and his work on the radio broadcasts, Zegura also co-hosts Cleveland Browns Daily with Beau Bishop. That show airs Monday through Friday from 1 to 3 p.m. on ESPN 850 Cleveland. (Definitely not a radio station that keeps coming up here.) And he has a remarkable Twitter bio: “Cleveland Browns Senior Media Broadcaster; @Browns_Daily M-F 1-3pm ET; Proud Father of 2, 2 TIME AFFL CHAMPION w/ @vinceconde (@mikethemiz Has NO AFFL Titles).” Not sure why he’s taking shots at The Miz, but okay. A guy with a laptop on his couch in Moreland Hills is working the ultimate fantasy: He makes a living as a fantasy football consultant, advising nearly 2,000 team owners — actor Ashton Kutcher among them. …This time of year, Zegura awakens to a few hundred e-mails and has online exchanges with subscribers throughout the day. “It just doesn’t stop,” said Elissa Zegura, whose best friend in high school was Kutcher’s personal assistant. Fox, meanwhile, is a former NFL and NCAA player who cohosts “Bull and Fox” on 92.3 The Fan, writes for The Athletic Cleveland, and calls some college games for ESPN. But there apparently haven’t been any profiles written on him advising Ashton Kutcher in fantasy football, and he doesn’t seem to be feuding with The Miz. It’s pretty rare to see a NFL radio broadcast change its on-air staffing midseason, but it’s also rare to see a sideline reporter accused of confrontations with NFL officials. And while an eight-week suspension is pretty massive, if this involved previous incidents and league pressure, it’s understandable why the Browns are coming down hard on Zegura. We’ll see if he does in fact return in November.